We’d love your help. Let us know what’s wrong with this preview of Cleaning the Kingdom by Ken Pellman. To ask other readers questions about Cleaning the Kingdom, please sign up. About 3 times longer than it should have been. Editing is amateur. (I spotted at least a dozen typos without even trying). Needs a couple of detailed maps because hard to visualize all the locations the authors talk about. Also a few pictures would be nice to correspond to the "lingo". I thoroughly enjoyed this book. It's an engrossing, detailed account from true Disneyland insiders. There are niche books, and then there are NICHE books - this falls in the latter category. Disneyana is niche enough, but a 400+ page book detailing the work schedules and habits of ONE department at Disneyland over a 20-year period is epitomizing nicheness. That's not to say it's not worth reading - although some of the detail is way too in-depth for general consumption, there is a lot here that is very interesting as it details the ways the sweepers interacted with Disneyland and its guests. An There are niche books, and then there are NICHE books - this falls in the latter category. Disneyana is niche enough, but a 400+ page book detailing the work schedules and habits of ONE department at Disneyland over a 20-year period is epitomizing nicheness. Cleaning The Kingdom, from the podcasters that bring us ‘The Sweep Spot’, is a passionate, insiders view of the Magic Kingdom. It has been painstakingly written, and great care has been taken to keep the magic alive. The authors, Ken and Lynn, are the Disney employees you want to read about. They worked at Disneyland through the good times and the bad times, and have moved on to bigger and better things, but continue to remain convivial and nostalgic about their time at Disney. This puts their bo Cleaning The Kingdom, from the podcasters that bring us ‘The Sweep Spot’, is a passionate, insiders view of the Magic Kingdom. It has been painstakingly written, and great care has been taken to keep the magic alive. The authors, Ken and Lynn, are the Disney employees you want to read about. They worked at Disneyland through the good times and the bad times, and have moved on to bigger and better things, but continue to remain convivial and nostalgic about their time at Disney. This puts their book apart from some of the others on the market that seem bitter and twisted, and happy to be away from the Mouse. Ken and Lynn have covered a wide range of topics in their book, and you can read particular chapters that are of interest to you, or if you want the full experience, read it cover to cover! There’s ‘code v’s’, celebrity sightings, secret areas and where they would take their breaks, Disney culture and VIP events. A great insiders view of all the best parts of Disney. They don’t sugarcoat the hard times, and they provide you with an open and honest account of their experience at Disneyland. The grammatical errors were prevalent. Perhaps a few more read throughs by the editor would have solved that distraction. Otherwise, the insight this provides to the workings of... working at the park was great. Certainly makes me yearn for a churro while I cruise by Blue Bayou on Pirates of the Caribbean. Now, though, I'm going to make a point of thanking the custodians at Disneyland. A good read for Disneyland fanatics like us. But the editing was pretty poor, making some sentences unreadable. So happy to have read "Cleaning the Kingdom: Insider Tales of Keeping Walt's Dream Spotless", as my mind was opened to this amazing aspect of the Disney company we always appreciate, but rarely hear a lot about. We learn about the various responsibilities, tasks and kinds of shifts of Disneyland janis. Loved reading about typical day, special days, notorious days, changes to the park, knowledge imparted by lifelong cast members, parade mishaps - all that sort of stuff. I am grateful the two auth So happy to have read "Cleaning the Kingdom: Insider Tales of Keeping Walt's Dream Spotless", as my mind was opened to this amazing aspect of the Disney company we always appreciate, but rarely hear a lot about. We learn about the various responsibilities, tasks and kinds of shifts of Disneyland janis. Loved reading about typical day, special days, notorious days, changes to the park, knowledge imparted by lifelong cast members, parade mishaps - all that sort of stuff. I am grateful the two authors took such a positive approach. While this book gets into the dirty side of Disneyland (see what I did there...), thankfully it is frank and honest without being a dishing dirt sort of book. All that being said, this book desperately needed an editor. In the worst way. An editor would pick up a wrong word being used, the occasional typo and missing punctuation that made some sentences challenging to understand, repetition of information - sometimes on the next page when the narrative switches from one author to the other - and likely help simplify the middle chapters. We didn't necessarily need to know in such detail where each cleaning zone was in each section of the park for chapters on end; One chapter that breaks it down high-level, or [keeping any intellectual property issues in mind] perhaps a few maps could have helped in this regard. Interesting look at how the happiest place on earth is kept so clean, by two former Cast Members from Custodial. You'll learn some things, and some things you wish you didn't. I didn't think the book was very well written, and it was far too long! Needed an editor. There's probably better Disney books to read for fans. Reads more like a bunch of blog posts placed in book format, but there is lots of good information in this book. Could have used some more editing to get it down a few dozen pages, but it’s a good read and if you love Disneyland, I’m sure there are quite a few things you’d find interesting in this book. Very detailed, reads like a text book....a few interesting stories that kept me reading...kind of like waiting in a very long line for a 3-minute ride - a lot of extraneous information to wade through. I enjoy a well written Disney book and memoirs - this is both. A fun read from an unusual point of view - the often overlooked jani. Can janitors be an interesting topic? Despite a really horrible one semester one bathroom custodial shift, I am going to say in some circumstances yes! And seeing a book about Disneyland’s famed custodial cast members is probably one of the most interesting Between Book topics I had seen in some time. I knew this for sure, it was not going to be your typical guidebook! Cleaning the Kingdom: Insider Tales of Keeping Walt’s Dream Spotless by Ken Pellman and Lynn Barron provides some custodial histo Can janitors be an interesting topic? Cleaning the Kingdom: Insider Tales of Keeping Walt’s Dream Spotless by Ken Pellman and Lynn Barron provides some custodial history, a layout of how Disneyland was cleaned and personal stories from the men and women in White. Pellman and Barron spent years in Disneyland’s custodial department from the 1980s to 2000s. The two former custodians are passionate about what they did and the legacy that the white clothed crew has left in the hearts of guests. The 400 plus page book is clearly the most exhaustive book ever considered about these cast members. The authors open with a historical review of Disney’s custodial services including the key cast members who made the Custodial department the legendary unit it became. The authors then share in great depth their experiences including their typical day, how they cleaned Disneyland and an exhaustive land by land breakdown of the park and the services needed in each area. Amongst their report of what it was like to be a day custodial employee are personal accounts from themselves and friends about guests, cultural changes, and of course the chapter of the gross which readers are warned may not be for everyone (you will not be surprised to find the worst bodily fluid situations in this chapter). The two close the book discussing why they left Disneyland and reflecting on how their experiences impact them to this day. Let me just start with this simple observation. I now am noticing dustpans, including one that I recently used, evaluating them on their material make-up and their usefulness. I am sad to say that I found my most recent sweeping lacking, as I do not believe my plastic pan would have been able to remove gum! So if asking the question if a book about custodial could be interesting, the fact that I’m thinking about dustpans really answers that question quickly for me. Another aspect of the book that really interested me was the short but complete history of Disneyland custodial services. The history includes the names of important staff and a history of the department. For me this chapter was a great touch giving a very serious historical view of the department. As someone who was evacuated once behind stage and seen a packer and recycle sorting, I found it very interesting to read a breakdown of where the custodial areas were and how they were accessed. And I became very impressed with the hard work and dedication that Disneyland’s janitors historically have worked with. I liked leaving the book with a better understanding of where does the trash go, what sweeping lines entails, how Indy is treated special and how urine is urine regardless of source. I do have some critiques. The authors identify often who is writing, and sometimes to keep my reading flow going I really could have been satisfied with a “we” instead of “Lynn” or “Ken”. However I assume their podcast fans would not agree with me. And on occasional the material seemed repetitive. But that is likely due to the very through nature of the book. 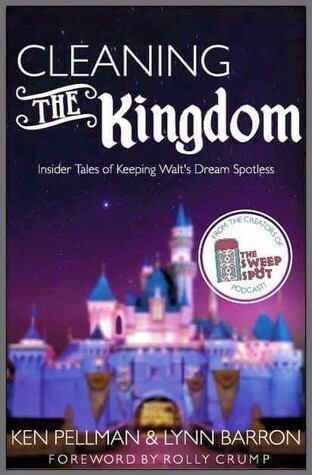 Cleaning the Kingdom: Insider Talesof Keeping Walt’s Dream Spotless by Ken Pellman and Lynn Barron is a book that Disneyland fans will clean up on. It feeds into fans who want to know all things Disneyland by showing the dirty side, literally, of the park. From their observations about in park developments such as wardrobe changes, their personal thoughts about Disney and their detailed explanations of cleaning the park, fans will want this volume with a very different point of view. I was shocked by how thorough this book This book gets 5 out of 5 stars! As a huge Disney fan and one who follows the Sweep Spot podcast, I snagged this book as quickly as I heard about it. I think I discovered a whole new genre of book- non-fictions about the various aspects of my favorite theme park- Disneyland! Like many Disney fans, I have often wondered what went on behind the walls of the magic. What would it be like to work in such a place as Disneyland? With this book, we get a good idea. I was shocked by how thorough this book was. One chapter is a nearly minute by minute description of a custodian's day at the park. Other chapters detail how they divided the park into sections, the amount of people that cleaned each section, and descriptions of the work they did. I had no idea how complicated being a Disneyland custodian could be! I am sure that one of the reasons Disneyland is so darn clean is because the schedules and locations of each custodian is so completely organized. I definitely grew to have a new respect for the people that keep the parks clean. As interesting as all these details were, they were not my favorite chapters. I also enjoyed reading about how knowledgeable custodians are about the park and their interactions with the guests. There were some heartwarming, sweet stories in there! Custodians are often the ones who interact most with the guests because they're always around! Finally, Ken and Lynn shared a bit of Disneyland history through their stories of watching the changes that occurred while they worked at the park. For example, Ken tells the story of taking the last ride on the Monorail. I'll admit, I'm predisposed to loving all things Disney, being born into a family of Disney fans, as I was. And it's true, I'm predisposed to loving all things related to keeping things clean, having OCD and mysophobia*, as I do. Still I think this book is fascinating to nearly anyone who is at all curious about theme parks in general, Disneyland, what it's like to be a Disney Cast Member, or wondered how the parks maintain that exterior shine of glitter and pixie dust when you just know people I'll admit, I'm predisposed to loving all things Disney, being born into a family of Disney fans, as I was. And it's true, I'm predisposed to loving all things related to keeping things clean, having OCD and mysophobia*, as I do. Still I think this book is fascinating to nearly anyone who is at all curious about theme parks in general, Disneyland, what it's like to be a Disney Cast Member, or wondered how the parks maintain that exterior shine of glitter and pixie dust when you just know people are puking after riding teacups, and that many of those thousands of little kids brought in every day are still pretty darn inept at using the potty. Enter the Janis! Not Janis, like the Muppet, but Jani-short-for-janitorial. Plural. They see all, they know all, and a lot of that is recorded in this book. I resisted opening it up to the chapter containing all their grossest stories to read them first, but when I finally got to that roller coaster ride full of "oh my god"s and a few moments that might make you need to put down the book and go wash your hands, I found myself wishing it was longer. This book is just fun. The authors do a great job of bringing you into their experiences in a way that makes you feel like you belong, like you're right there behind them trying to keep up as your broom and pan (metal, if you're lucky) knock against your knees. It's your first day doing what they do, and you're feeling lucky to get to do it. The book definitely could have used an editor, or at least a proofreader. If you can overlook the editing errors and typos, the writing is very good and the content is fascinating. I loved this book, it's one of the best books I have read all year (365 days, not just January), and I hope that they will get together with some cast members from Walt Disney World to produce a follow up. If they do, I'd be honored to be the one to proofread it, pro bono, just to get to be the first to read it. *That's germs, not mice. I love mice! Very clean mice. This was a great glimpse into the magic! Love the guys at the Sweep Spot, one of my favorite podcasts. Great content...but the editing was lacking and there were quite a few typos. I really enjoyed this look at Disneyland. I think the stories about the regular guests were very interesting. I think it could have used another edit but I would recommend to a Disney fan.